Nothing burns a visual greatness of fantasy into one’s mind better than a huge transparent face in the sky. And a woman with a large snake wrapped around her… yes I suggested it, and in fact I insist on it! Just make sure she’s grasping her magical wand. This to me looks like someone’s vanity publishing project. Therefore we can’t mock the publishers…we have to mock the author for his/her (who wrote this?) bad, bad taste. Brown is not a good colour. For clothes, carpets or book covers. Really, it’s not. And the font? And the floating face? And the damsel with dreds clutching her wand? And the white snake? And the ruins? And the desert landscape? I just don’t know where to start. So many shades of wrong. Creative Writing courses should use this site as a resource, writers who self-publish can see what traps to avoid. Oh yea, good point. This probably is a self-published book. So I’ll defiantly be fair on it. Yes this bears the mar of self published. Interestingly (well you know, sort of, but as we’re on this particular site I’ll hazard a guess that my least successful party conversational gambit may have slightly more legs on this accasion) while the awfulness of the artwork is something its difficult to avoid – good art costs (hell, even bad art costs as we have seen) – waht they could fix without spending too much money is the type. Go big! Go san-serif! Compress! But no, inside you get insipid, white, times roman at no larger than 18pt, floating apologetically somewhere on the cover. Do they not look at published books? Oh and author vanity project? Not too much vanity – where’s the author name? 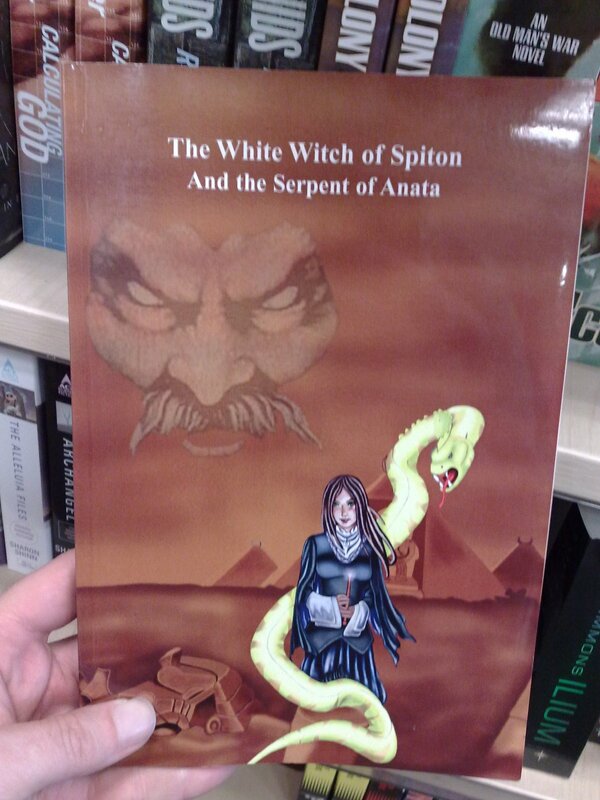 Or is this ‘And the serpent of Anata’ by The White witch of Spiton? Oh dear God I think it may be . . .
(Readers of the previous post will be delighted to see that I’ve been making full use of the ‘preview’ feature – ‘waht? ‘mar’? Though actually ‘mar’ is quite appropriate and I could claim that was intentional. Amazon reviews are actually very positive. I think its a Harry Potter sytle book aimed at young teens… So SI you might actually enjoy it. btw is the snake floating? CSA> Oh you know how much I love teenage wizards and 300 year old vampires dating 14 year olds. I especially love your fan fiction and I am defiantly counting the days to your Harry Potter Versus Predator series. Simon > *coughs* I also note you forgot to close your brackets! School Boy error, negative marking, down two points! I think the main fault of fantasy and sci fi books is their cover are too “literal” … although not “literary.” Like some cheeseball movie trailer (“In a world … one man against evil” … etc., etc.) Brings up the valid question, if a fantasy book involves X and Y and Z, why do publishers insist on showing ALL OF THEM? No nuance or hinting or anything involving higher brain functions. Might offend the mouth-breather virgin fanboy demographic I guess. The one redeeming feature here is the floating-face-guy’s epic nasal hair. Personally I’m impressed by the horrendously visible pixellation on the white witch (although since she’s wearing black and the ‘white witch’ is apparently the author’s name, perhaps this is a random person being menaced by the serpent of Anata, which is also known as ‘And the’). Ok, I felt somewhat bad about submitting this cover. Bit of an apology coming up. When I first saw it in a Borders store (now defunct, I understand), I was taken aback by it’s arresting visual nature. The fact that it was a self-published book nestling amongst shelves of BAEN! !1!11 piqued my interest, so I took a photo reasoning that even though the cover isn’t the usual Good Show style, the authorship must be really quite good to get carried by a major chain like that, so perhaps we can give them a bit of exposure. Sure enough, it turns out that the author is a lecturer in literature, and one of her other books was an Aurealis Award Best Young Adult Short Story finalist. From the positive reviews on Amazon it looks like this should have been filed under children’s fiction or young adult fiction rather than in with the Webers and Nortons. I’ve been checking out the cost of prints and originals for some of the other awesome artists featured on Good Show Sir, and they go for over $200 USD to around $10,000 USD. Clearly a self-publishing penmeister can’t be expected to shell out the cost for that sort of thing. Sometimes you’ve just got to get the book out there and on the shelves. I should have bought it when I had the chance, especially as this seems to be a rare cover – if I see it again, it shall be mine! Best of luck with the books, Ms Rolfe. By the way, top left on the photo, what sort of epic title is “Calculating God”? Picture the scene – two white haired Einstein-a-likes in their ink stained lab coats, in a deserted lecture theatre, papers strewn over the lecturer’s desk. Blackboard filled up with chalked formulae. Profuse sweating and brainthoughts. Scientist 1 completes cramming a lengthy formula onto both halves of the blackboard by scrawling ” = ??? ” at the end of it. At this point the Neo-Jesus bursts up from the concrete bunker housed miles below in a secret military facility, a giant mecha stumbles through walls and roof…. Karl > Welcome to the chaos! It did seem for quite a while to be pretty obvious with your story archs on the front of the cover. These days, in the UK at least, people tend to go for a dark cover with a single item or person. I think I’ve even noticed a whole section of Terry Pratchett books that now only have black covers. Excellent Neo-Jesus reference Justin. You forgot to mention the ion-cannon being primed in space because the military hyper-spirit monitor goes off the scale! Pity only two people will get that…. There is one thing I have noticed this morning that needs to be noted. The face in the sky has shaved off his eyebrows! then she looks cropped out and shoved onto this book cover. The artist has already been notified and is talking to the publisher right now. Though it’s a different picture right? I mean the drawing of the cover above isn’t exactly the same. Have we helped discover some sort of publisher copyright infringment? Awesome! Surely everyone has a cousin or something they can call on to do a drawing better then this, jeez… Also, unfortunatly she’s not called the white witch of spiton, but Tracey Rolfe. Disappointing. I read it as “spitoon” too, and thought “at least that explains the color”. That’s the floating face from that crappy Trek movie where everything sucked except Sybok., and we’re all Kirk asking “Why does God need a GSS cover?”. That’s one wicked mohawk on that snake. Those look like TV antennae on top of the pyramids. Zardoz seems to be lost. Evey Fortran programmer knows GOD is REAL (unless declared INTEGER)…. Well, I don’t think it quite deserves that, but almost. That snake’s got quite the power of levitation, since its weight is resting on neither the ground nor the woman. Is the snake, in fact, the white witch AND the serpent? Or is the levitation due to the ever-popular radioactive powers, since the thing looks glow in the dark color? The tiny, tiny type that still somehow didn’t leave enough room in all that expanse of brown for the author’s name. Mr. xn noticed the girl’s lack of legs. @daard23: It’s much improved! GSS! @fred: ITYM the best Star Trek movie ever.